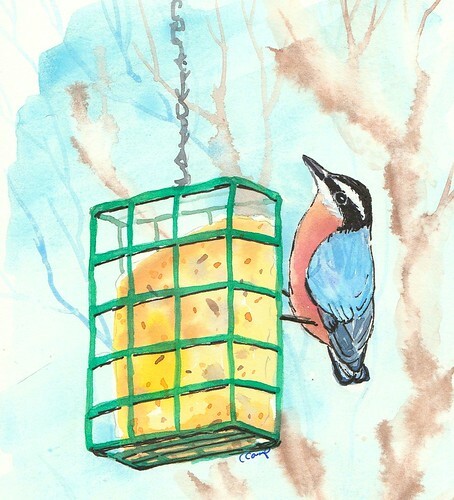 A Red-breasted Nuthatch Said Hello – Let's Paint Nature! A Red-breasted nuthatch (Sitta canadensis) came by to say, “Hello.” In return I fed him suet. I quietly sat contemplating his woes. They are many, for while he ate his breakfast it was a mere 8°F. He ate alone and used the pine tree in my backyard for cover several times: grabbing suet, flying to the pine, returning to grab more, then taking cover in the pine, repeat. While he was at the suet feeder, he paused to look around. He knows he’s prey. He needs to be careful. Not scanning your surroundings can be costly. While he braves the predators, he must brave this cold too. Some strategies this cleaver little nuthatch has is to use his tiny little muscles to puff up feathers, creating a warm pocket of air from the warmth of his body which can be 102-107°F (Lawlor 1998). Another strategy is shivering, but this comes at an enormous energy cost. The high fat content in the suet can provide such energy but only for so long. Another reserve he has is to drop his body temperature way down when he is inactive. This allows him to conserve his energy. In all his struggles he is provided for, in this moment. So am I, I must remember. And very blessed to have this visit with him. Lawlor EP. 1998. Chapter 8: Birds. Page 150 in Discovering Nature in Winter. Stackpole Books, Mechanicsburg, PA.